One day a relative received this photo. 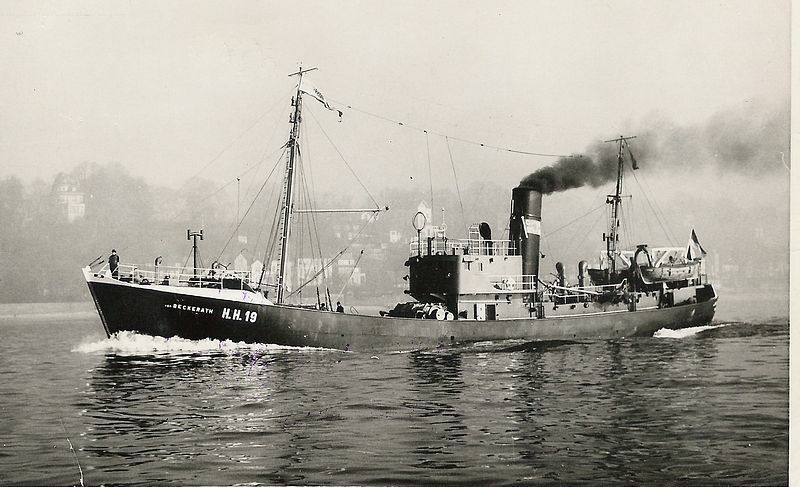 It shows a fish-trawler with the name "von Beckerath". The relative had no idea about the origin and the background. Recent investigations came to the following results. Most probably the name of the ship was given in honour of an important share holder as one of the last members of the board told. Today we know that this share holder was Oskar von Beckerath. In the course of the decline of the German herring-fishing industry the ship was scrapped already after 9 years in service in 1962. On July 18, 1847, the barque "Hermann von Beckerath", 580 tons, left under Capt. 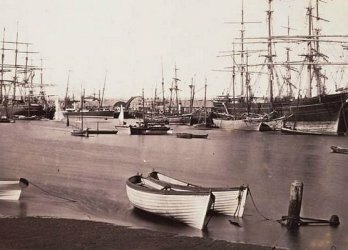 Kahle Bremen harbour with 290 passengers bound for Rio de Janeiro, Brazil and Port Adelaide, Australia where she arrived safely on December 15, 1847 after nearly 5 months on sea. She carried emmigrants, merchants and engineers. After research in various museums (Auswandererhaus and German Maritime Museum in Bremerhaven, Lloyds Register in London and Focke Museum in Bremen) finally the State Archive Bremen was in the position to clear up the secret of this vessel. 2. ships name: "Hermann von Beckerath"
On the following painting (original size 60 x 40 cm, owner: Focke Museum, Bremen) we can clearly identify the barque "Hermann von Beckerath" by the streamer on top of the main mast with the context "H.v.Beckerath". On top of the foremast there is a flag showing the number „231“, on the mizzen-mast in height of the gaff we find the characteristic flag of the city of Bremen and on top a flag which cannot be identified, possibly the office flag of the shipping company. 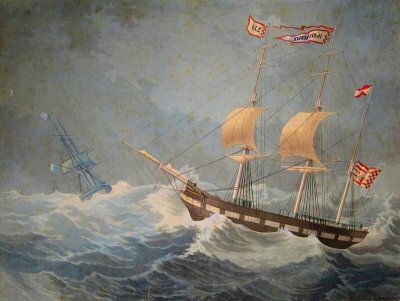 The vessel is running under reduced sails in a storm and high sea. There are set the fore top sail and the main top sail which were undivided at that time. All other sails have been taken away. This implies a wind of 9 - 10 beaufort. The hull of the vessel which was most probably made of wood shows the characteristic canon port painting. Most obviously the "Hermann von Beckerath" was not equipped with canons but this special "design" had a deterrend effect. When regarding the picture a little more closer we do not find any person on deck or in the rigg, even a wheelman is missing. This is unusual since the maritime painters usually tried to figure the ship or the situation in a most detailled way. On the painting we can see two more ships, one of them quite near to the "Hermann von Beckerath". It seems to be a brigg, with reduced sails as well. On the horizon we can recognize another three-mast-sailing ship. It is unclear if the ships or one of them are in an emergency situation. The closer ship seems to be of french or dutch origin following the flag at the gaff. Further details are not shown. The painting was made by Anton Lowtzow in 1847. We also do not know what happened to the vessel later. It is still open why the name "Hermann von Beckerath" was given to the vessel. Our ancestor with this name, the banker and finance minister, was still member of the county parliament in 1847. Wether this position was sufficient enough to grant his name to a ship is questionable because he became finance minister not before 1848. In the part of this website reserved for family members only you will find a report about this journey in form of a letter. The letter was written by one of the female passengers and was adreesed to the wife of the captain. It perfectly describes the situation, the behaviour on board, the different social levels of the passengers and the circumstances of the journey.